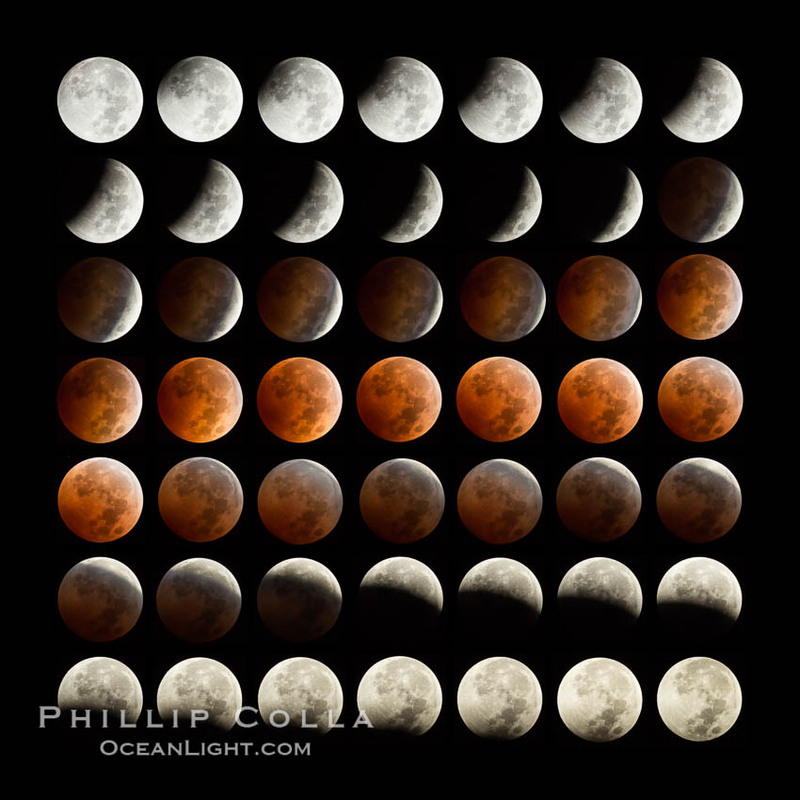 I have made a few photographic sequences of lunar eclipses, including several of the total lunar eclipse of April 15 2014 (version 2, version 3). 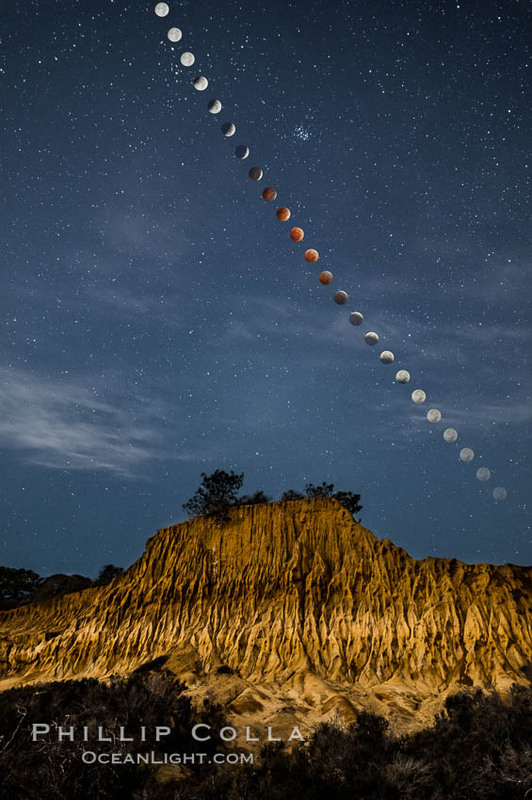 I wanted to do something similar for the October 8 2014 lunar eclipse, but did not have the freedom to go photograph out in the desert where the air was likely to be clear. On the evening of the eclipse conditions were iffy, and down on the beach the air was heavy and wet so the pier was out — it was on the verge of turning to fog. Up on the mesas above and inland from the beach the air was much clearer and drier but still the shooting looked iffy, I was not sure the eclipse would even be visible. As it turned out I was able to get the images for which I was hoping, although things were not as clear as I probably would have found in the desert. My planning for the eclipse was something like this: the penumbral phase of eclipse was to begin at 2:15am at 227 degrees on the compass and inclination of 53 degrees. Full eclipse would begin at 3:25 (245 degrees, 41 degree inclination) and end at 4:24am (256 degrees, 30 degree inclination). The penumbral phase would end at 5:34 (266 degrees, 16 degree inclination). This meant the “rectangle” that the path of the eclipse would take through the sky was roughly 40 degrees horizontally (left to right on the compass) and spanned a vertical inclination of about 37 degrees. I figured a lens with about 24mm of focal length, or a little more, held in portrait orientation — which covers approximately 73 degrees vertically and 53 degrees horizontally would work well, since it would allow for some foreground and would cover the entire left-right travel of the moon with room to spare on all sides. Mind you this may sound like some sort of complicated math but in truth a few minutes with The Photographer’s Ephemeris and a few notes on the back of a VISA envelope were all that was required to set up the plan for that night. The “center” of the eclipse would be at a compass angle of about 250 degrees, so I setup my camera in that direction, configured it to shoot periodic bracketed images all night long using an intervalometer, and crossed my fingers the sky would remain clear for the two and a quarter hours that the eclipse would happening.